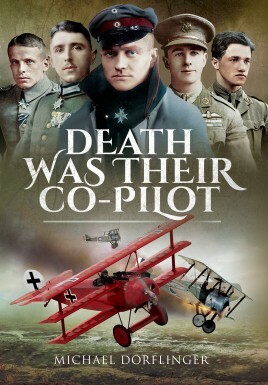 Death Was Their Co-Pilot; what an apt title. You could also add that death was their constant companion. Of the fifteen original German Fokker monoplane pilots in 1915, none lived to see 1917. This book is filled with facts as sobering as that one. It also tells you about Gustav Leffers, who was a 'Blue Max' ( Pour Le' Merite) recipient, and he actually flew in a captured Nieuport 16. The book starts with the story of Roland Garros. Then it goes into the life of the first air ace Celestin Pegoud. The next ace's life it goes into is British ace Lanoe Hawker. We change gears, and go into the exploits of the first Fokker monoplane (eindecker) aces, Immelmann, Boelcke, and the rest. The 'Dicta Boelcke', Boelcke's commandments for aerial combat are still taught today. Naturally the book goes into the controversy of the number of 'kills' for each pilot. The German method seems to have been the 'best' as far as being able to actually account for all of their pilots' claims. However, the book uses some examples, specifically with Herman Goering, that sometimes the Allied and German records do not match up. This is especially true when it comes to pilots who claimed numerous kills on solo flights into enemy territory. Of the four nations: Britain, France, Germany, and the U.S. and their highest ranking pilots, only Germany's Richtofen did not survive the war. Richtofen's younger brother Lothar, was able to amass forty victories in only seventy-seven operational days. A lot of the pilots carried pistols for suicide in case they were shot down in flames. In World War I the powers that be decided that the airplane, and not the pilot, was important so no pilots were given parachutes in the beginning years of the war. During 'Bloody April' of 1917 the life span of a British pilot was on average three weeks. It seems that if luck or innate skill was with you in the beginning of your career, you were then offered up a large diet of fledglings. The book is filled with so many stories of heroism and patriotism, it is hard to pick the best examples. So many on each side returned to the fray in physical and mental conditions that should have kept them in a hospital bed, and not a cockpit. The other fronts besides the Western are touched on, as is the evolution of both armaments and the actual planes themselves. If you are looking for a book that shows the facts and figures, but also goes deep beyond them, then this book is for you.